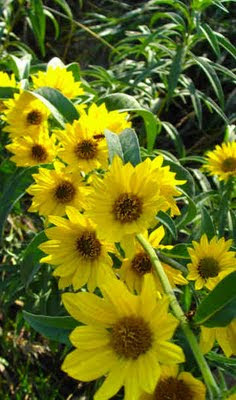 When the first tinge of orange appears on the scrub oaks, the Mexican sunflowers (a/k/a Maximilian['s] sunflower—Helianthus maximiliani) are blooming. They are a New World plant, although not native this far north, where they need extra water, especially in early summer. In moister climates they can be invasive—not a problem here. Other than that, and an occasional infestation of stink bugs, they are a bulletproof perennial, which is what I like. At our house they start blooming about the second week of September, just when everything else has pretty much finished, even the wild Liatrus.